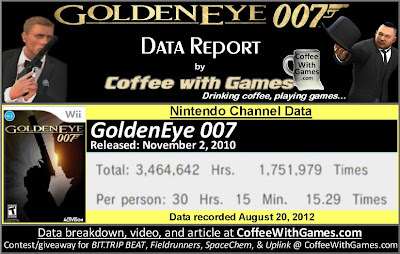 GoldenEye 007 now has approximately 114,583 U.S. Wii owners that have reported game-play data through the Nintendo Channel, which is almost 30,000 more players that have reported data since this past November. The game has an average play-time per day/session now of about 1 Hour 58 Minutes, with its overall average now being 30 Hours 15 Minutes "Per person" as the image above shows. The "professional" critic review score has remained the same since November, still sitting at 82.77% based on 62 reviews on GameRankings.com. GoldenEye 007's customer review score average based on just the "Standard" software only version is now 77.59%, a slight increase since November, now based on 158 customer reviews on Amazon.com. GoldenEye 007 for the Nintendo 64 was released in the U.S. 15 years ago as of Saturday, August 25th. It was my favorite and most played Nintendo 64 game that I owned, and I still enjoy playing levels in it from time-to-time. 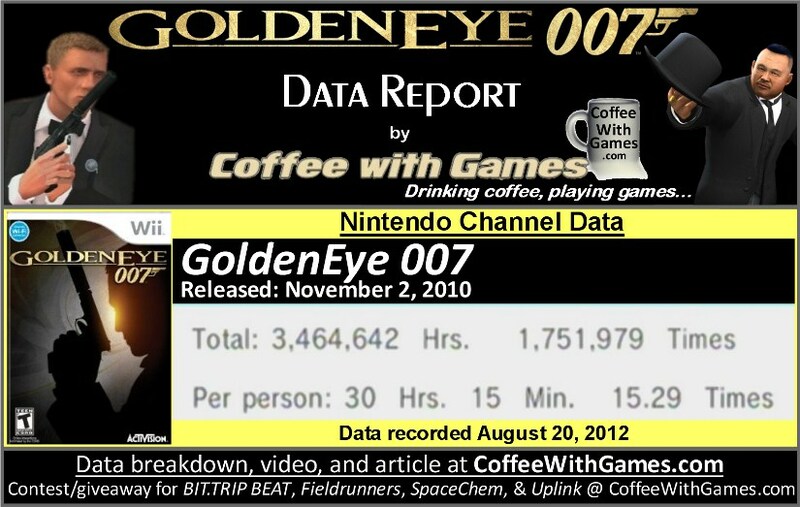 When Activision and Nintendo revealed GoldenEye 007 for the Wii at E3 2010, I was glad to see it. While I knew the game wasn't going to be a direct port of the original, it looked like Eurocom had put a good bit of effort into it, and I purchased it the day it released for the Wii. While I haven't played the Wii version in a while, I did enjoy the single-player campaign and put a good number of hours into the online multiplayer modes as well. I don't know how active the online multiplayer community is still going though, but just based on the reported data for the game it is apparently being played a decent amount, because it has one million more hours reported now, than were in the last report 9 months ago. 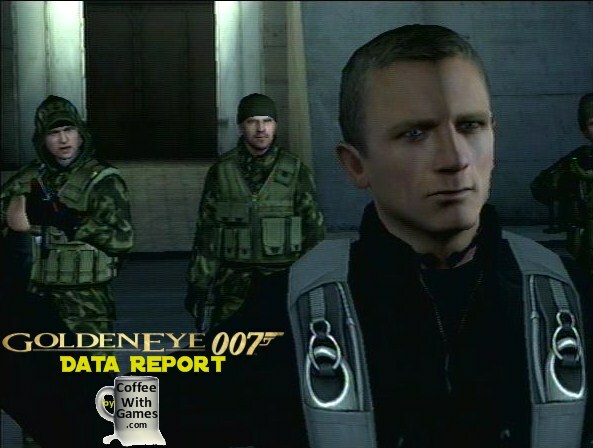 If you enjoy FPS games for the single-player aspect, I would recommend giving GoldenEye 007 for the Wii a try. If you are looking for people to play with online, my friend code for the game is 2043-7355-3797. The Wii version, as well as the PlayStation 3 and Xbox 360 version, can now be found for under $30 at most retailers, and considering the average hours are now more than 30 hours "Per person" on the Wii, I would think the PlayStation 3 and Xbox 360 versions would offer just as many hours of game-play. With the original game releasing 15 years ago this past weekend I wanted to look at the newer GoldenEye another time, before looking back. What do I mean "before looking back"? Well, I should have a new feature up this week called "Retro Grind", on the original GoldenEye. If you are looking for the games giveaway link, you can find it HERE. If you have already entered the contest/giveaway and want another entry, just tweet out this post using the "Tweet" button at the bottom of the post including my Twitter tag @CoffeeWithGames in it. You can also get an additional entry if you have "liked" the CoffeeWithGames Facebook page HERE, and by liking this post on the Facebook page. 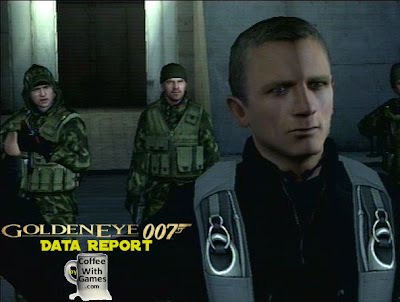 Have any of you been playing GoldenEye 007's online multiplayer for the Wii, and if so, how active is the online community? If you own the PS3 or Xbox 360 version, have you had a chance to play the MI-6 mode that is exclusive for those consoles and what do you think of the mode? I don't have the Wii version, only the PS3 version, and I had pretty mixed feelings about this game. On the one hand, I rather enjoyed the plot, it was a pretty good remake. But for my mind the game had been too "Call of Duty-ified." It was too linear - run down a path, shoot a horde of enemies in a room, run down another path. The moments of stealth felt too forced, to me - it's like the developers knew they had to do them, so they dedicated small sections of each level to them. The reason I loved the original Goldeneye was because it had non-linear objectives (you could miss parts of levels in the lower difficulty levels entirely), and because it was possible to get through some of the levels from start to finish by being stealthy. There's also the unfortunate fact that I only ever got one game of multiplayer going - and that felt just like a CoD map. Nothing like the Facility multiplayer level of Perfect Dark and the original Goldeneye. But it was a well-made game overall, with some tight controls and a solid Bond plot. I just preferred the Quantum of Solace game, which seemed to me to be more true to the Bond spirit. On an unrelated note I am really, really excited for the upcoming Bond game. I just really hope they don't stick so closely to the CoD formula this time. 30 hours only? I will say the community for this game is dying day by day as this game is approaching it's 2 year mark, which is ancient for a FPS. However, the on-line campaign is very time consuming and a very good player would take 10 days (240 hours) to make it to the top level. There are many people with on-line play times in the 30-50 days range. The most active forum for this game is GameFAQs/Spot, and some over at NintendoLife. "On the one hand, I rather enjoyed the plot, it was a pretty good remake. But for my mind the game had been too "Call of Duty-ified." It was too linear - run down a path, shoot a horde of enemies in a room, run down another path." While it controlled like a Call of Duty game (on the Wii anyway), it didn't have the "jump" function which I liked. I liked how they had the "vault" option instead, and that worked well in multiplayer as people weren't hopping around like rabbits. As for the "linear" part, I'm not sure how much exploration the levels have on higher difficulty settings, as I really only played through the campaign once, and briefly started a second attempt. "The reason I loved the original Goldeneye was because it had non-linear objectives (you could miss parts of levels in the lower difficulty levels entirely)..."
You aren't the only one...Dam, Facility, and Bunker, come to mind right now for being spread around, but not having to go through sections to finish them. "Facility multiplayer level of Perfect Dark and the original Goldeneye..."
If this were a test though, I would have to go with the "All of the Above!" if asked which one. "On an unrelated note I am really, really excited for the upcoming Bond game. I just really hope they don't stick so closely to the CoD formula this time." Yea, I have been watching/reading the emails on 007 Legends, and it looks like a very cool concept for a Bond game and fans of the Bond movies. I wonder if it will hit the Wii U...because right now it isn't confirmed for it. "my gaming backlog makes it hard to justify grabbing a whole lot new these days"
Unless....UNLESS, you run a site about incomplete games and stuff, then it is not only justified...BUT REQUIRED. "hypocrite though I am, since I do expect Madden to arrive from Amazon tomorrow, lol"
You didn't win the competition either I take it. #WastedMyTime! #MaddenNFL2013ZeroOutofTen! However, the on-line campaign is very time consuming and a very good player would take 10 days (240 hours) to make it to the top level." I agree, I played it a decent amount, and only hit Level 25 (I think)...it takes FOREVER to level up, which is one issue I hope Eurocom learned from for the upcoming 007 Legends release. I actually wondered if they fixed that leveling up system in the PS3 and Xbox 360 versions, but can't remember reading anybody confirming/denying they did. As for the active forums, I did play some matches with people from NintendoLife a few times. I can only imagine how well the higher levels are playing now. these numbers are ridiculously low. no wonder there was only shovelware for the wii. Low compared to the PS3 and 360 hours? Or, low compared to another Wii game? 30 hours is low? That's huge for me. :) I'd still like to get back in there and make some progress on the single player. Anyway, it was fun from what I played and too bad about the multiplayer dying off. (though for almost 2 years on a non-patch Wii game is pretty good) As mentioned the leveling up is too much of a grind and it's a shame. See, this never-ending incomplete backlog is contagious and frankly good for the economy!